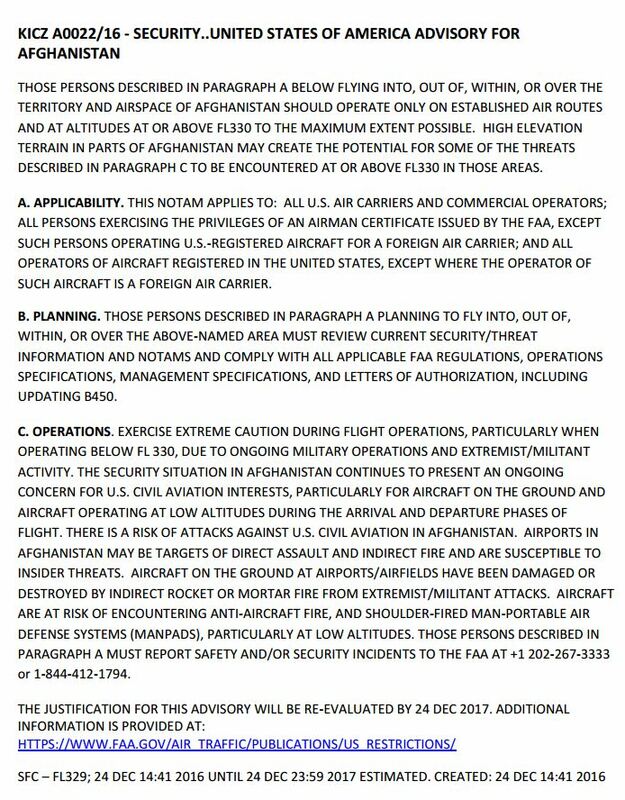 The U.S. Federal Aviation Administration extended the Conflict Zone Notam on Afghan airspace by a year, warning American pilots to stay at or above FL330 over Afghanistan. The FAA initially banned all U.S. flights from the Simferopol and Dnipropetrovsk areas on July 18, 2014, the day after Malaysia Airlines flight MH17 was shot down near Hrabove, Ukraine. The FAA continued to evaluate the situation in the area and has determined there is a continuing significant flight safety hazard to U.S. civil aviation. Although the European Aviation Safety Agency’s (EASA) published a Safety Information Bulletin (SIB) on February 17, 2016, indicating that ATS routes L851 and M856 could be considered for planning flights in the Simferopol (UKFV) FIR, there is continuing concern over the hazard to U.S. civil aviation from possible conflicting air traffic control instructions from Ukrainian and Russian air traffic service providers. Shortly following the EASA bulletin, the Russian Federal Air Transport Agency responded with a press release in which it again asserted that it was responsible for air traffic services in a portion of the Simferopol (UKFV) FIR. The Russian circular (from Feb 21, 2016) further stated, “The Russian Federation does not bear the responsibility for the provision of safety to those flights, which will be operated within Simferopol FIR under control of ATC unit other than Simferopol Air Traffic Management Centre.” Russia contended that EASA’s decision was politically motivated and `pose[d] a threat to aviation safety in the region.’ In addition, there have been reported incidents of purposeful interference, including GPS jamming, in the Simferopol (UKFV) and Dnipropetrovsk (UKDV) FIRs. Based on this information, the FAA continues to assess that there is a significant flight safety hazard to U.S. civil aviation in the Simferopol (UKFV) FIR. In the Dnipropetrovsk (UKDV) FIR, there is an ongoing risk of skirmishes in the area and a potential for larger-scale fighting in eastern Ukraine involving combined Russian-separatist forces, according to the FAA. This could result in civil aircraft being misidentified as a threat and then intercepted or otherwise engaged, as demonstrated by the shoot down of Malaysia Airlines Flight 17. These combined forces have access to a variety of anti-aircraft weapons, to include man-portable air defense systems (MANPADS) and possibly more advanced surface-to-air-missiles (SAMs) that have the capability to engage aircraft at higher altitudes. Separatists have demonstrated their ability to use these anti-aircraft weapons by successfully shooting down a number of aircraft during the course of the fighting in eastern Ukraine in 2014. More recently, Organization for Security and Cooperation in Europe (OSCE) Special Monitoring Mission to Ukraine (SMM) unmanned aerial systems (UASs) also have been shot down by surface-to-air missiles and small arms ground fire, and brought down with GPS jamming in the Dnipropetrovsk (UKDV) FIR. These considerations caused the FAA to extend the flight ban from October 27, 2016, to October 27, 2018. U.S. authorities have banned all Samsung Galaxy Note7 smartphone devices from aircraft over safety issues. The U.S. Department of Transportation (DOT), with the Federal Aviation Administration (FAA) and the Pipeline and Hazardous Materials Safety Administration (PHMSA), issued an emergency order to ban all Samsung Galaxy Note7 smartphone devices from air transportation in the United States. Individuals who own or possess a Samsung Galaxy Note7 device may not transport the device on their person, in carry-on baggage, or in checked baggage on flights to, from, or within the United States. This prohibition includes all Samsung Galaxy Note7 devices. The phones also cannot be shipped as air cargo. The ban will be effective on Saturday, October 15, 2016, at noon ET. The order explains that a Samsung Galaxy Note 7 device “may cause an ignition or a dangerous evolution of heat or become a fuel source for fire.” Samsung acknowledged this fact with the September 15, 2016 recall, Samsung’s October 11, 2016 announcement that it was suspending the manufacture and sale of the Samsung Galaxy Note 7 device, and the October 13, 2016 Samsung expanded recall covering all Samsung Galaxy Note 7 devices. Furthermore, persons have experienced incidents of dangerous evolution of heat with the recalled Samsung Galaxy Note 7 device, also on aircraft.